There’s nothing better than waking up to the smell of pancakes and bacon for breakfast. Pumpkin pancakes are always a favorite during the fall, and when I saw this idea at notmartha.org I knew I had to make them for Halloween! Eating these pumpkin pancakes is so much more fun when you can draw your own design with the black cinnamon syrup. Not surprisingly the kids LOVED showing off their Pancake Picassos. I don’t know about you, but we love breakfast for dinner! 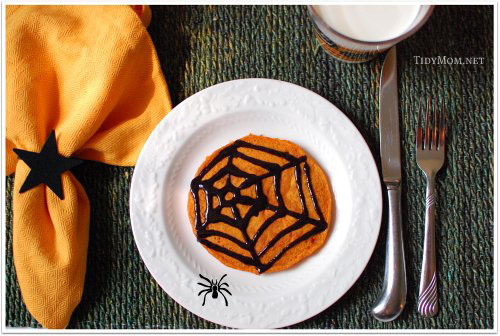 So before they go door to door for candy, you could make this Spooktacular breakfast for dinner! There’s nothing SCARY about making these pumpkin pancakes! Halloween Eyeball Pudding Treats for dessert! LIKE THESE SPOOKY PUMPKIN PANCAKES? PIN IT! Do you make any special food for Halloween? There's nothing SCARY about making these orange pumpkin pancakes with black cinnamon syrup for Halloween breakfast or dinner. Preheat a skillet over medium heat. Coat pan with no stick spray. Combine eggs, buttermilk, butter, pumpkin, sugar, and salt in a large bowl. Use an electric mixer to blend ingredients. Add dry ingredients to wet ingredients and blend with mixer until smooth. Add just a few drops of gel food coloring until you get a nice orange. Pour or scoop the batter onto hot skillet, using approximately 1/4 cup for each pancake. 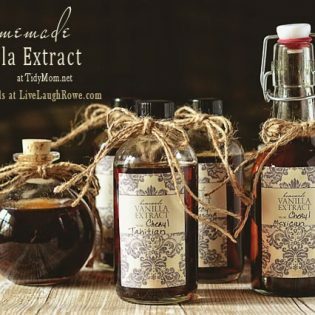 You can make the syrup the night before and warm it by dipping the squeeze bottle in a bowl of warm water. My kids would love these!!! I love the orange and black color of the pancakes and syrup. Looking forward to meeting you in Napa. The chocolate spider web is so adorable! I wish I could try to recreate something similar, but I am afraid mine won’t come out so neat. I guess a pumpkin is a bit easier to draw. I love, love, love, love, love these. O.k. *seriously* how stinkin cute is that?? LOVE it Cheryl! These are adorable. I’d never be able to create such cute (and recognizable) drawings with the syrup, but I’ll just convince myself the black blobs are Halloweeny in their own way. These are darling. I’m going to have to use this with my little guy. He will love it. This is so cool! My kids would love these. Wow, these are absolutely darling!! SO cute. I must make them… but the black syrup is a little bit scary! Such a fun I’d for a Halloween breakfast! These are absolutely adorable! I think I”ll have to surprise my kids with these on Halloween morning. Too cute! I just have to share this in my Halloween Hodge Podge today. Thanks for the idea!!! Love those! 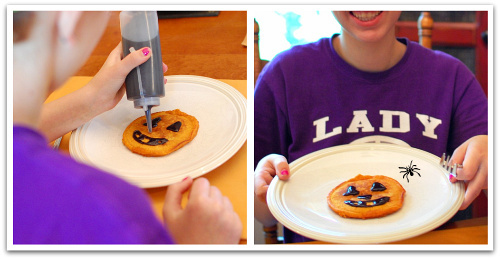 The idea of creating jack-o-lantern pancakes is too cute. Hi Cheryl! I am making Paula Deen’s Ooey Gooey pumpkin bars for a Halloween party this weekend and I’m going to decorate the top with this black cinnamon syrup. I’m so excited! Thanks for the idea. Those are too stinkin’ adorable! Love love love this recipe! I made it for my kids this morning. However, my spiders really looked like gooey ticks. 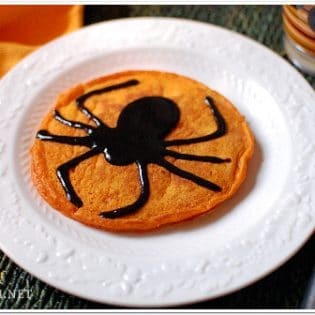 So I’m renaming them “Halloween Tick Pancakes”. I posted a photo of them on Facebook! Thank you so much for hosting…I LOVE your blog, it’s awesome! Very cool pancakes…my kids will love them! I’m not a great pancake maker…I think b/c I have really bad ADD in the kitchen! Do you have any suggestions on how to alter the batter for waffles? Oh my goodness, what a perfect Halloween breakfast! 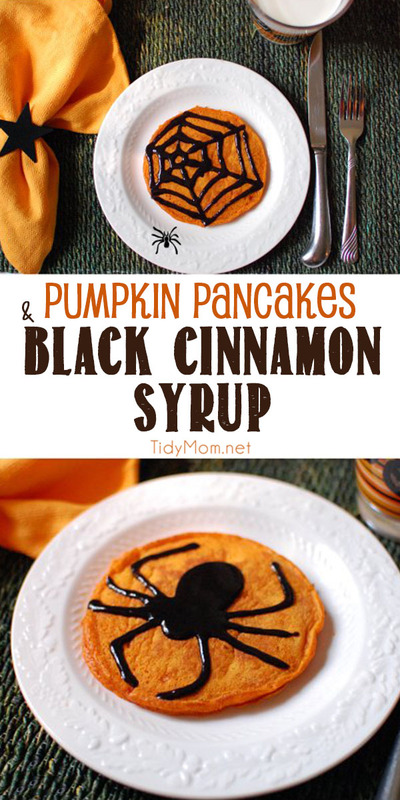 I love how bright and orange the pumpkin pancakes are with that deep black syrup! So fun! Cheryl- these are so cool! My kids would flip for these pancakes!! those look fun and yummy! These are crazy cute!!! And not sure why I have never thought of pumpkin in my pancakes!! This is the perfect breakfast for this Halloween season! My kids would go nuts over those. I need to do that on Halloween morning. Cute! Cute! Cute! My kids will think these are so cool. So adorable and “spooky” 😀 Love them! These are the cutest, Cheryl! So creative and perfect for the season. great idea Cheryl! Love these! You are so creative! 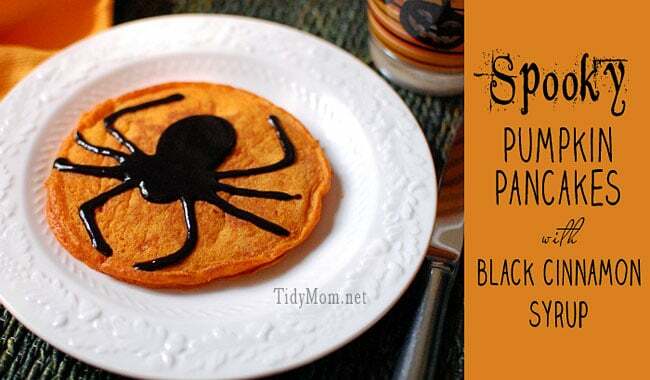 Such a fun idea, your syrup spider is perfectly piped! 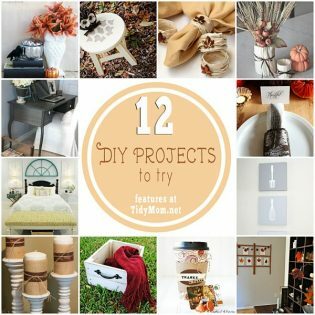 What a fun idea this is! Thank you for sharing it. 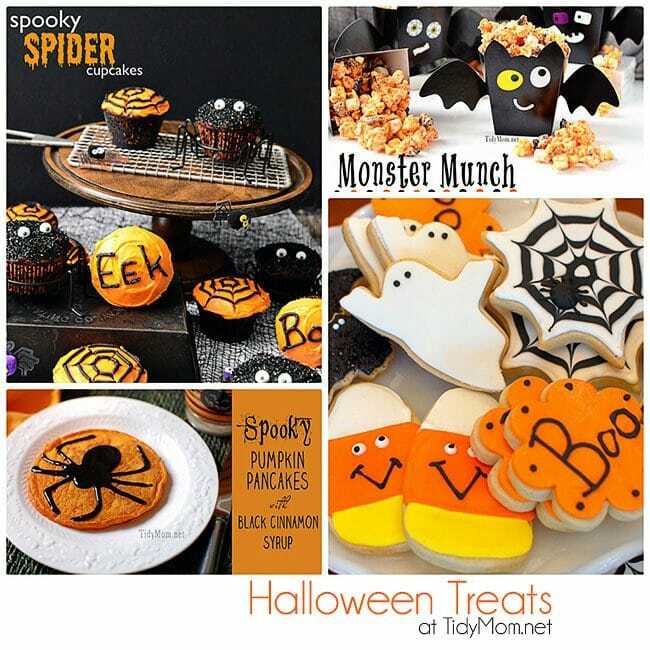 I’ve featured your post in my “Halloween Meals” blog post today so that others can enjoy it too. FUN!! Awesome spider. Our girls would LOVE this! !